You’ve got a perfect body. Yes, you! Your eye-lashes catch your sweat; you gag when you swallow a fish-bone; you laugh when you get tickled. 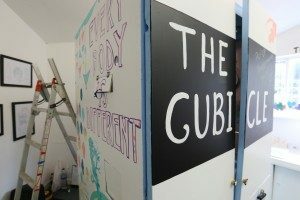 Step inside The Cubicle – a space where you’re perfect just the way you are. Performance written, directed & designed with Sarah Davey-Hull & performed by Oliver Langdon & Caroline Garland. Produced in partnership with the Public Engagement Unit at the University of Bath.